But don’t worry! If you want to learn how to advertise on Google, you’ve come to the right place. In this article, we’ll give you a quick overview of how to advertise on Google and the basics you need to understand before you start running ads. Advertising on Google with AdWords is one of the best decisions you can make to expand your reach, find new customers, and grow your business. Google AdWords is the world’s largest and most widely used online advertising platform, and by advertising on Google, your business can reach a potential audience of millions. To advertise on Google with AdWords, you’ll need an AdWords account. Advertising on Google with AdWords requires an AdWords account, which you can create for free on the official Google AdWords page. Of course, creating your AdWords account is just the first step. Next, you’ll actually need to create your campaigns. Simple enough, right? Unfortunately, while it’s fairly easy to start advertising on Google, successfully advertising on Google is another story. Covering every possible optimization nuance is beyond the scope of this article (but check out the rest of our blog for hundreds of tips you can use to get the most out of your campaigns), so in this article, we’ll focus on the keystone of Google’s advertising system: the auction process. Unfortunately, you’re not the only business out there who wants clicks from Google users. To make sure that your ads are seen, you have to outbid the competition. The Google auction is a lot like any other auction, except that Google cares about more than just your money—they also take the relevance and quality of your ads into account. So, if you create high quality ads, you can potentially pay less per click than the competition…and still outrank them! Unlike display advertising, where you bid to have your ads displayed on various sites across the web, AdWords advertisers bid on specific keywords in the hopes of having their ads show up when potential customers search for those keywords on Google. Depending on the quality of their ads and their maximum bid, Google decides what order ads are displayed to users in and then it’s up to your ad to catch a potential customer’s eye and convince them to click. When most people think of an auction, they imagine shelling out tons of money to buy the item that they want. Google AdWords auctions do not work that way. Instead, you bid on a keyword that you think will be relevant to searches. In an AdWords auction, you can bid virtually any amount, but keep in mind that AdWords PPC-based platform, so it can be expensive, especially if you don’t know what you’re doing. When someone does a search that includes one of your target keywords, Google will look at the keywords that you bid on and will decide which words are relevant to the words which were just searched. It’s important to note that Google will not suggest a useless advertisement to someone using their website. That could hurt their credibility and it would make you pay for useless words. That’s why being relevant is important. Ad rankings determine where your ad is placed on the Google results page (if it is even placed on there at all! ), which can be a little confusing for a lot of us. But don’t worry, it’s not as complicated as it sounds. Ad ranking makes it possible for your ad to be visible to users who are searching for specific products. Advertisement visibility can lead to clicks which can lead to conversions, so making sure that you rank high important. But how do you do that? Well, there is an equation for that. This may seem confusing, but I promise, it gets easier. There are three parts to Ad Ranking that we need to look at before understanding everything. One: Maximum Bid; two: Quality Score; and three: Format and Extensions. This area is pretty cut-and-dry. The maximum bid is the highest amount that you are willing to bid on a keyword that you want to have in the “auction”, so to speak. The more words you have in the auction, the higher your chances are of having a hit. Again, these words are important because they will give user a chance to see your advertisement as long as it is relevant to what they searched, so choose wisely. Like I mentioned before, although you may have a high bid, it doesn’t guarantee that your ad will be seen. Google wants to make sure that its consumers are seeing relevant ads. To do that, AdWords assesses your website, keywords, and landing pages to see how well they are designed. That is what constitutes your quality score, or the rating that Google gives you based on the relevance of your PPC ads regarding what was searched. Your rating is anywhere between one and ten. (Ten being the best, one. . . needing some hard work.) The higher your rating the better. This is what really counts. If you have a high quality rating, even if you don’t pay the highest bid, odds are that your ad will be seen. Remember the equation for success: Maximum Bid * Quality Score = Ad Rankings/Ad Visibility. Hopefully, that improved ad visibility leads to conversions. 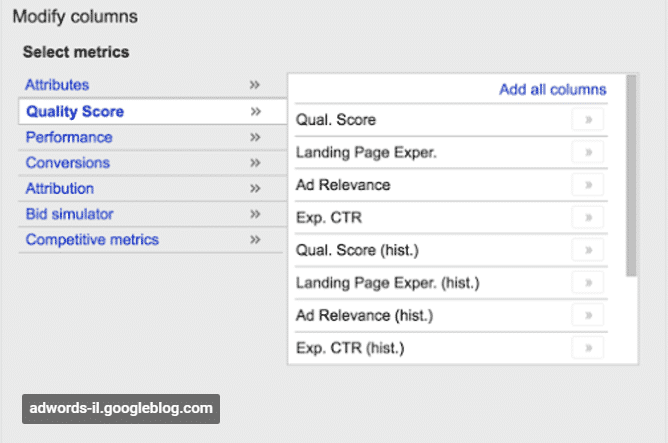 To keep an eye on your quality score, you’ll need to click “Add columns” and add quality score as a column to your Google reports. Ultimately, how much you spend on Google AdWords and how effective that spend is all boils down to the picking the right keywords, choosing the right bids and creating high quality ads. The AdWords auction process is designed to encourage you to create effective ad campaigns, so the better your advertising is, the better your quality score should be! All-in-all, it’s not hard to advertise on Google. Making money from your AdWords advertising is more of a challenge, but if you understand the auction process, it should be easy to identify ways to improve your advertising (again, for specific recommendations, check out the links in that 8-step process I mentioned or do a specific search on our blog). By the way, if you’d like help putting together your first AdWords campaigns (or want more insights into the auction process), let me know here or in the comments. I’d love to help! Excited to advertise on Google? Have advice to share with new advertisers? Leave your thoughts in the comments! I wish to advertise on google.Iam an ophthalmologist and want to advertise my two practices.